Levy’s own experiences in the word give her a unique perspective on the role of the immigrant. Here’s some background information on Levy from her website: “In 1948 Andrea Levy’s father sailed from Jamaica to England on the Empire Windrushship and her mother joined him soon after. 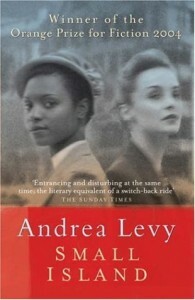 Andrea was born in London in 1956, growing up black in what was still a very white England. This experience has given her an complex perspective on the country of her birth. The TV adaptation of Small Island has won a Broadcast Award for the Best Single TV Drama. It has also won an International Emmy in the US for best TV movie/mini series 2010, and was nominated for several BAFTAs, winning for best music. If you haven’t seen the TV adaptation it is now available on DVD. Small Island was the subject of a recent Guardian Book Club feature. Here is a link to a podcast of Andrea talking about the book with John Mullan and answering questions from the audience. This entry was posted on Monday, April 25th, 2011 at 3:05 pm. It is filed under Small Island. You can follow any responses to this entry through the RSS 2.0 feed.